A good sign catches people’s attention; a great sign actually gets these people to step into your restaurant and try your food. Here at Saber Sign Solutions, we don’t settle for just good restaurant signs…we design and deliver GREAT ones. 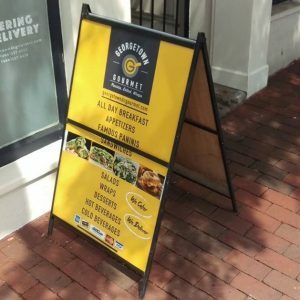 Effective signage for restaurants starts outside your building and carries through your facilities, providing an attractive, cohesive, and professional feel. We want potential customers to experience the quality of service that you offer from the moment they set their eyes on your sign. 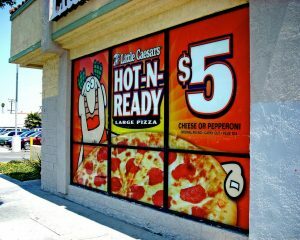 We specialize in creating effective restaurant signage. By working with you from conceptualization up to implementation, we make sure that you get a sign customized to your needs and budget. Call Saber Sign Solutions today at (512) 861-2699 for a Free Consultation! When a potential customer passes by your restaurant, those precious few seconds they spend looking at your signage will make all the difference. We believe in the power of outdoor signs that are stylishly made and strategically placed…and that’s exactly what we intend to create for you. It’s important for each business to have storefront signs that are easy to see and lovely to look at, especially if your restaurant is located in a place where there’s a lot of traffic and tourists. 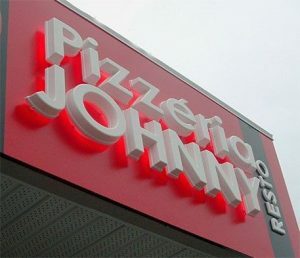 Our local signage experts can help you choose the sign type that best suits your brand and budget, whether it’s a backlit sign, illuminated sign, pylon sign, channel letters, 3D letters, etc. Saber Sign Solutions wants your sign to be visible and visual, and we also want them to be that way for a long time! This is why we use durable materials to produce tough, weatherproof outdoor signage that stays attractive long-term. We don’t stop at making your restaurant to look good on the outside. Our years of experience have taught us that customers pay for the overall dining experience…and this means your establishment has to look good on the inside, too. With artfully designed and carefully crafted indoor signs, Saber Sign Solutions helps your business achieve that polished, stylish look. We create custom wall murals, standard or digital menu boards, wayfinding signs, and ADA signs that speak volumes about your service. Quality indoor signs give your customers the information they need and, with our expert designers, we’ll make sure we keep your brand identity cohesive. Promotional restaurant signs can be used both indoors and out, to not only drive traffic to your business, but to improve sales of seasonal items, specials, or promotions. 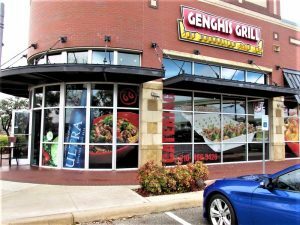 From window graphics, a-frame signs, and sidewalk signs to indoor banners, hanging signs, and daily special boards, Saber Sign Solutions creates every sign your restaurant could ever need. Saber Sign Solutions will work with you to create signs that are suitable for temporary or permanent promotions, allowing you to ensure your signage is always up to date. With fast turnaround and budget-friendly pricing, we look forward to delivering for you. With a strong team of signage specialists, Saber Sign Solutions is fully equipped to learn about your brand to create attractive restaurant signs that complement it. We handle every step of creating the perfect sign for your business…from conceptualization, to design, to materials, to placement, to final installation, and even maintenance, removal, or replacement as your business evolves. Regardlesss of the complexity of your project, or the number of signs you need produced, we are dedicated to delivering high-quality signs and graphics on-time and within budget. When you need effective signage, you can depend on Saber Sign Solutions. Our goal is to supply you with restaurant signs that make people want to step in your restaurant and dine. We’re excited to discuss how impactful signs and graphics can get your restaurant noticed, improve your customer experience, and increase your average ticket. Call Saber Sign Solutions today at (512) 861-2699 for a Free Consultation with a signage expert!